What is copyright? Who owns it and for how long? What rights does it confer, and what are the limitations and exceptions? Copyright for Archivists and Records Managers uniquely outlines copyright law in the UK with special reference to materials relevant to archive and records collections such as maps, legal records, records of local authorities, records of churches and faiths, most notably unpublished works. It also offers advice on rights in the electronic environment and the problems associated with rights clearance; and covers related areas such as moral rights and rights in databases. consideration of the many copyright cases that have come before the courts that have provided help with the interpretation of many aspects of the legislation; including the meaning of ‘transient and incidental’, ‘scientific research’, ‘parody’ and ‘originality’; whether hyperlinking infringes copyright; and the relationship between the rights of a copyright owner and freedom of speech. Tim Padfield said, “I am sorry that archivists and records managers keep having to buy new editions of this book, but a book on the law is of no use if it is out of date. In this case the law has changed very significantly since the previous edition, particularly for those working with archives and records and in libraries, educational establishments and museums. I hope it will continue to be useful”. 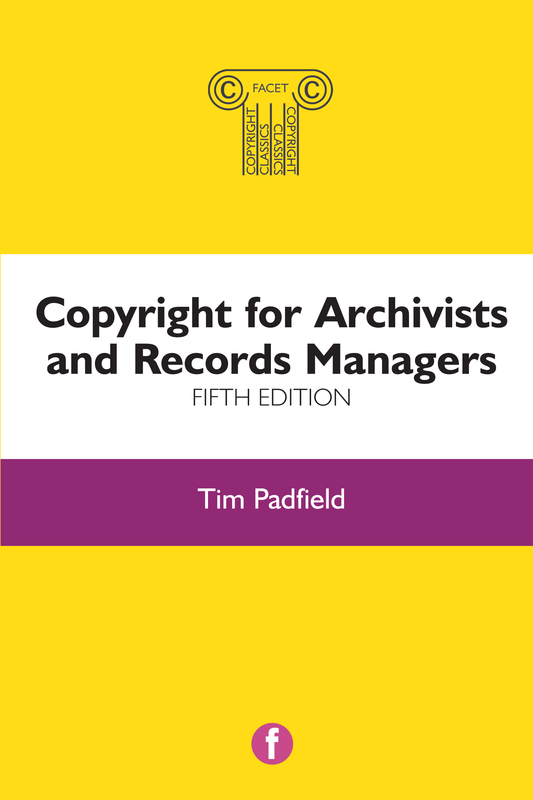 More details about Copyright for Archivists and Records Managers and a free sample chapter can be found on the Facet website.